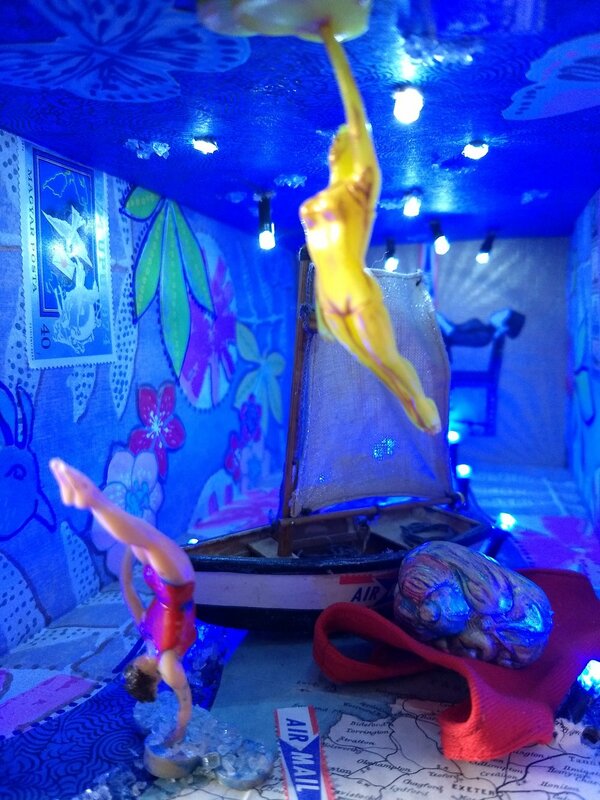 The Intergalactic Arts Federation at PO Art(Box) is on the Top 25 Public Vote List for Installation! Help us get to Round Two! 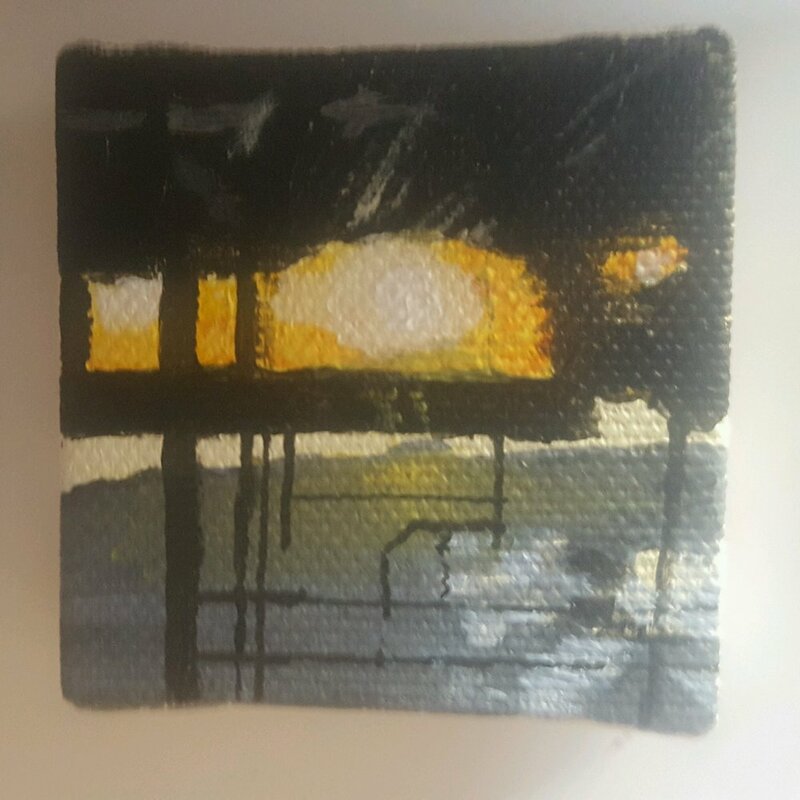 PO (Art)Box is specializing in small artwork since scale is often a majority factor in ArtPrize entries. Curator Sierra Cole says, "We all know that ArtPrize is about having a conversation about art, we just feel that most of the time that conversation revolves around large scale works of art. We want to flip that conversation and talk about how small works of art are just as viable as large scale works. They are just as challenging, time consuming, and complex as their large counterparts." 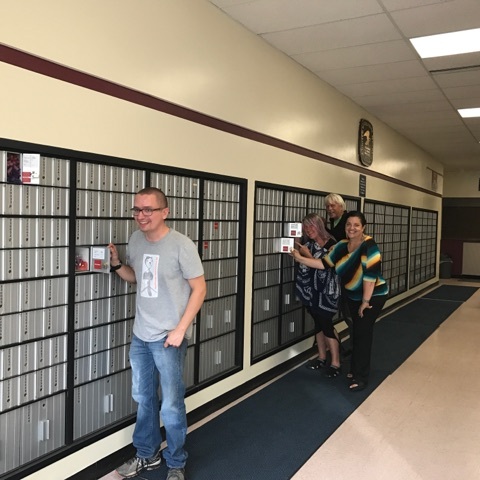 PO (Art)Box will be viewable during business hours inside the Post Office lobby. After hours, the artwork can be viewed from a custom made outdoor mailbox bank that will be located just outside the Ledyard Post Office. Saturday-Sunday - Post Office is closed, but artwork will be displayed on sidewalk outside the Post Office. d'Ann de Simone, Matt Landini, Heather Havens, Simon Houg, Lee Thomson, Cheryl Holz, Jovanni Luna, Monica Stegeman, Renee Therriault, Kiaralinda, Barbara Lash, John Whipple, Lynn Whipple, Howard Sheltraw, Kari Wilson, E.A. Wilde Cryderman, Christine Keller, Ed Derkevics and Sierra Cole were all chosen to show at a new venue located in city center during ArtPrize 10. Sierra started felting in 2001 under the guidance of her boss while working at small town newspaper. Discovering a passion for fiber and color, she left the newspaper to pursue a full-time career as a fiber artist. She has participated in art shows throughout the midwest such as: Laumier, Ann Arbor Art Fair, Gold Coast, Art Fair on the Square Madison, 57th Street Chicago, and Penrod. She has also shown work at 337 Project Space, Light Gallery + Studio, Paint Creek Center for the Arts, Lemonade Stand Gallery, and Kresge Art Museum. She was a participant in ArtPrize 2015 as part of Processing Fiber at 250 Monroe which was placed on the Juror Shortlist for Outstanding Venue by Steven Matijcio, Cincinnati-based Curator at the Contemporary Arts Center. Sierra graduated from Michigan State University in 2000 with a bachelor’s degree of fine art, with a focus on graphic design and printmaking. She lives and works in a 100+ year-old home in the Eastown neighborhood of Grand Rapids, Michigan. Sierra is a recipient of a 2017 Go Fund Me Matching Grant. Three and a half months after my parents, a clothing designer and an inventor, immigrated from the Valley of the Seven Dwarf Mountains and the Pied Piper Town of Hameln, I was born in Detroit, Michigan, home to decades of R&B, Gospel, and Jazz music. My mother had left her violin behind, but my father accompanied their songs and stories on his harmonica, which he joked was so much better than carrying a piano in his shirt pocket. We--five children eventually--were educated in the music of opera, folk music, and the symphony. We became engineers and artists with a lot of music and humor sprinkled throughout. As an artist and educator, I love to open doors for understanding and to make connections, especially creating interactive learning pathways. With degrees in Biology, Art, and Special Education, I have written music, won grants, and illustrated national curriculum projects, books, and magazines. I like to learn how things work and see surprises of people and nature. 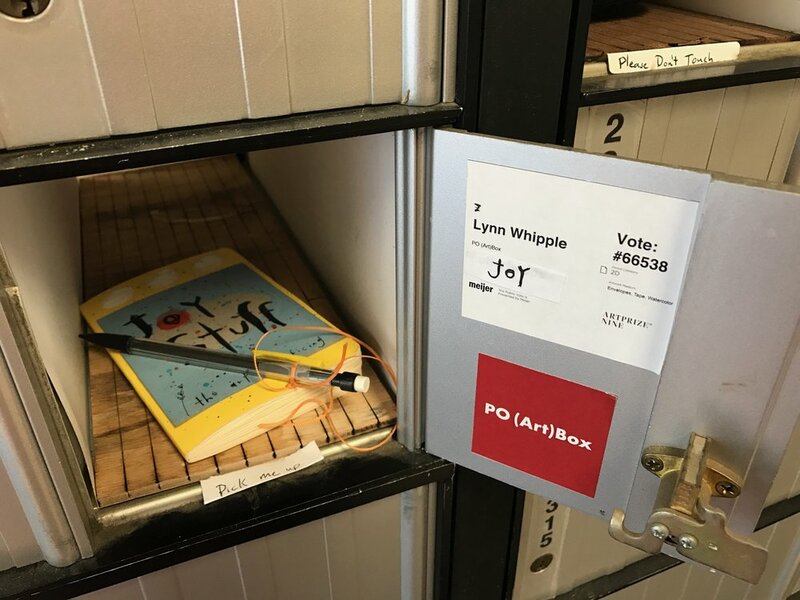 This work celebrates the joyful surprise of our diverse “musics”—in recording a unique self-portrait in a post office box, and radiating that visual, musical moment by sending it out. d'Ann de Simone is a Professor in the Department of Art, Art History and Design at Michigan State University where she teaches 2D courses. She also directs an Education Abroad summer course: Music, Art and Culture in Bregenz, Austria. de Simone is from Rhode Island and now lives in East Lansing and New Haven, Connecticut. She received her degrees in printmaking and painting from University of Massachusetts, Amherst and Rhode Island School of Design. She has a strong liberal arts education and attended Brown University where she studied graduate art history. de Simone shows her work nationally and internationally. She is represented by A.I.R. in Brooklyn, New York and at K12 Gallerie in Bregenz, Austria. She will be having a solo show in Brooklyn in 2019. My work is a homage to nature’s strength, beauty and diversity. I emulate natural aging processes by building up and wearing away various materials on hollow wooden panels. Anything from dragonfly wings to prairie grasses are embedded at various points of the process. The symbolic implications of the methods and materials are as important as the imagery. I enjoy balancing a wide variety of techniques; pouring a river of ink, creating a photo silkscreen of the night sky, or setting shellac on fire to capture the pattern the residue creates. I can spend the morning putting in a loose painterly wash of sky, then spend the afternoon rendering an intricate spider’s web in pen and ink. 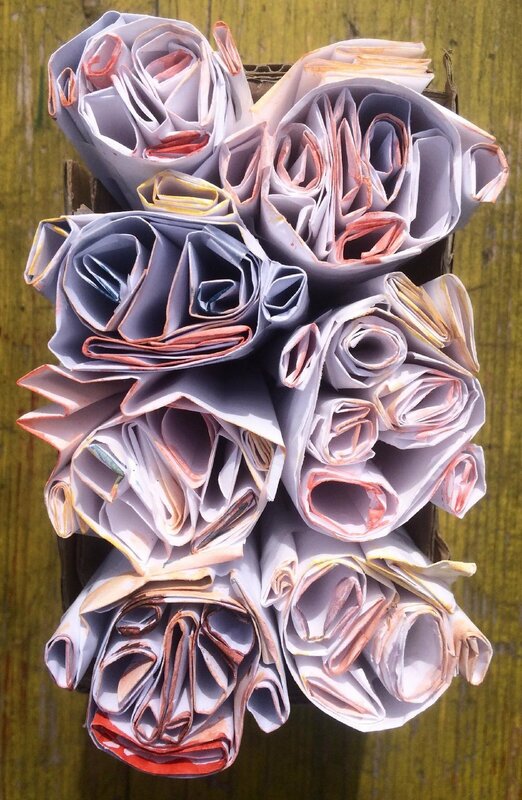 I carefully collect and press botanical specimens, batik on relevant quotes or song lyrics, and construct small wooden niches to house fragile natural finds like a quail’s egg or a butterfly. I enjoy finding the perfect process for whatever the situation calls for. In the studio I am always striving for equilibrium between spontaneity and deliberation, creating sensuous surfaces that reflect my process and balances the natural with the manmade. My goal is to constantly grow in and through my art. I'd like to inspire, in others, the same love of nature that I experience myself, thus promoting the recognition that we are inseparable from this earth we live in. I grew up in the country, collecting moss, bugs, leaves, and to my mother’s chagrin, snakes and salamanders. My rural upbringing had a big influence on my aesthetic sensibility and my artwork. I taught after getting an undergraduate degree in Art Education, then again after obtaining an M.F.A. I enjoyed it, but slowly became a full-time artist as interest in my work grew. My work has received national recognition, been shown in museums and galleries, and purchased by art collectors, corporations, and hospitals. I have completed 8 artist residencies, and received numerous arts in education grants from the Illinois Arts Council. My greatest reward by far,however, is loading my dogs into the truck and heading to my studio! Christine has lived in Cambridge, Massachusetts; Jalisco, Mexico and Leelanau County, Michigan. She has worked in a variety of art and craft media including bronze, clay, acrylic, watercolor, cement and quilt making. Christine has enjoyed teaching art to children and adults. She hopes her work brings delight, insight and possibly a smile to the viewer. Kiaralinda and Todd, the Whimzey Twinz from Safety Harbor, Florida- two of the most creative creatures in captivity! They create unique art forms made from aluminum wire they call Whimzey Wire. “Flight” is their whimzey wire Artprize entry in front of Holiday Inn Downtown Grand Rapids consisting of a field of dragonflies, bees, butterflies and flowers. Two of their largest artistic endeavors are their home/studio called Whimzeyland and theSafety Harbor Art and Music Center (SHAMc), their nonprofit arts center. 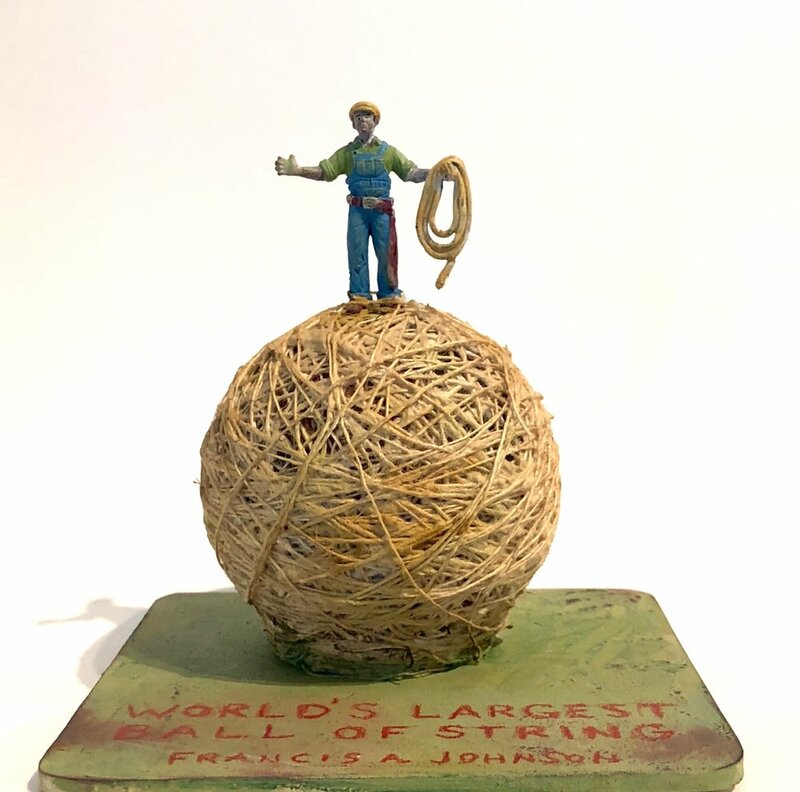 Barbara Lash started her professional art career as an entrepreneurial 9 yr old, gathering bits of found telephone wire and creating small sculptures that she sold to friends. Ever since, she’s been fascinated with the broken, cast off or discarded, finding beauty and meaning in things that others dismiss. In college, Barbara studied Fine Craft which gave her immersion in tactile arts like metalworking, fiber arts, glass working, ceramics and sculpture. Known for her beaded micro mosaic paintings and sculpture, Barbara (aka Barbara Danger) shows her work at fine art shows, museum shows and galleries around the country. A paintskin in its most simplest deﬁnition is latex paint, but the manipulation of the materiality allows it to take many forms and ideas. untitled exploration for a future installation is one of the many experiments that explores a speciﬁc technique for the construction of, “the landscape painting” a large scale installation that has been in development for a couple of years. By focusing on the material to create different shapes and being conscious of color, the paintskins are allowed to take a form that seem to represent familiar objects. Assemblage art gives me the freedom to explore new narratives by combining man-made and natural objects in a new way that can lead to transformation and healing. It tricks the subconscious into revealing the hidden shadow side. With this approach, there is a new path that appears for us to travel on. Remember When Stars Grew on Trees? 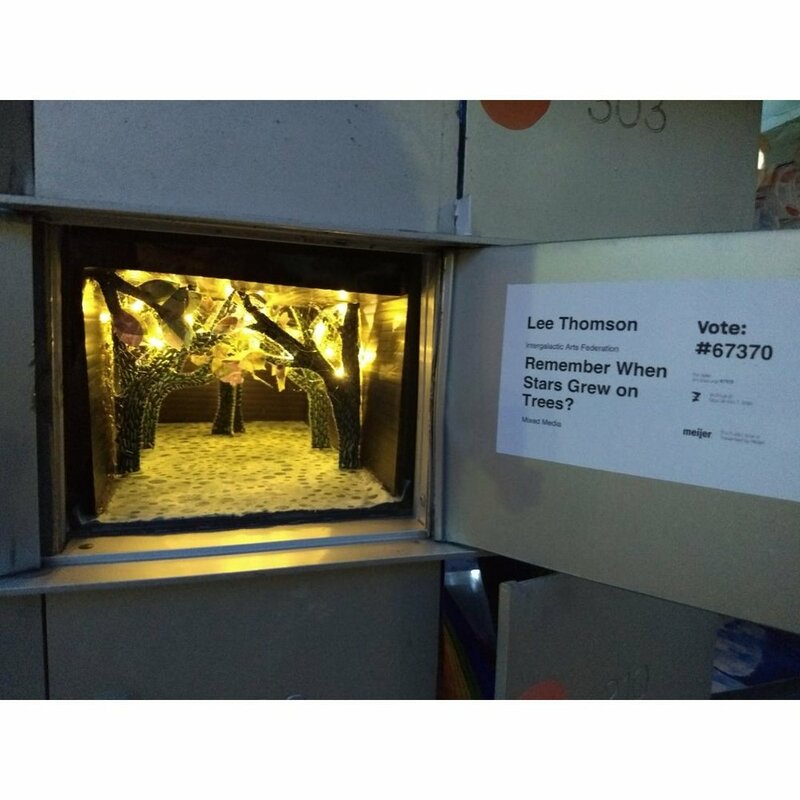 Lee Thomson has recently finished a mid-life crisis and is looking around for dragons. John graduated with a degree in commercial art and design and started his career as an art director. He later shifted to free lance illustration and also worked as a muralist, doing large jobs for Universal Studios and for the Orlando Science Center. After working for Nickelodeon Studios for a number of years, John and his wife Lynn, left to sell their own work though galleries and art festivals throughout the country, which they have continued to do for the last twenty years. John resides in Winter Park, Florida and has his studio at McRae Art Studios, an artist complex started by his family 28 years ago. Lynn grew up in beautiful Winter Park, Florida. She and her husband, artist John Whipple, are a part of the founding family that, in 1990, established McRae Art Studios in Winter Park, Florida. McRae is the home of 23 artists and is well known as a vibrant art collective in the Central Florida area. Lynn has received numerous awards including two Florida State Grants for Individual Artists, as well as two Professional Artist's Development Grants for Central Florida. Lynn teaches online and in-person mixed media, drawing and painting workshops. Kari Wilson studied art at San Francisco State and the University of Arizona where she earned an MFA. 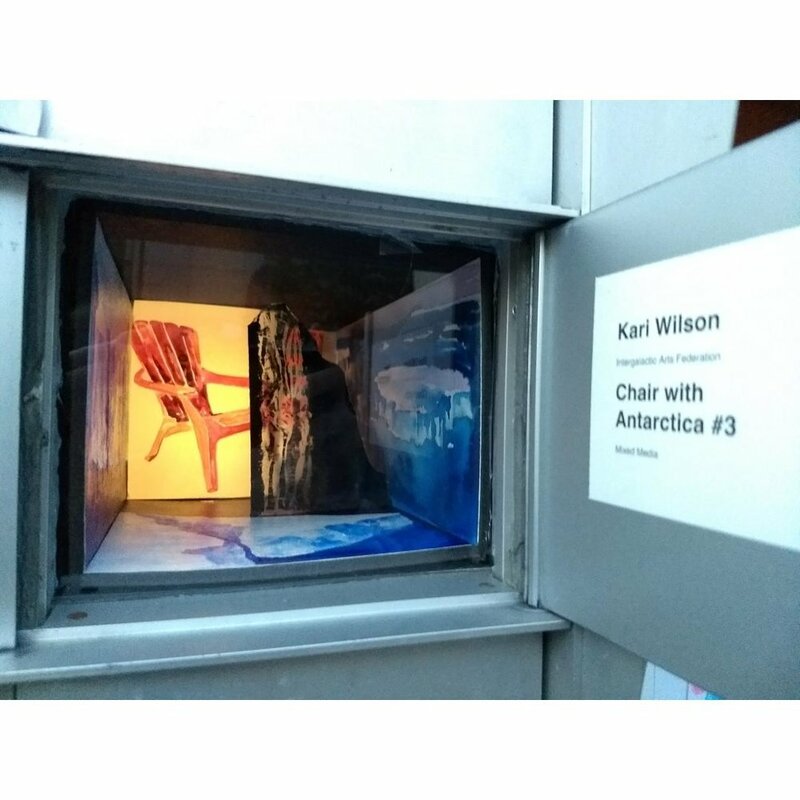 Kari’s work explores the aesthetic of catastrophe. She has exhibited her paintings widely throughout Michigan. This is her second ArtPrize experience. An art educator for many years, Kari currently teaches at the Gwen Frostic School of Fine Arts at Western Michigan. Eric Millikin, Firth MacMillan, Barbara Lash, Denise Ardis, John Whipple, Lynn Whipple, Ed Brownlee, Jonathan D. Lopez, Howard Sheltraw and Sierra Cole were all chosen to show at a new venue located in city center during ArtPrize 9. 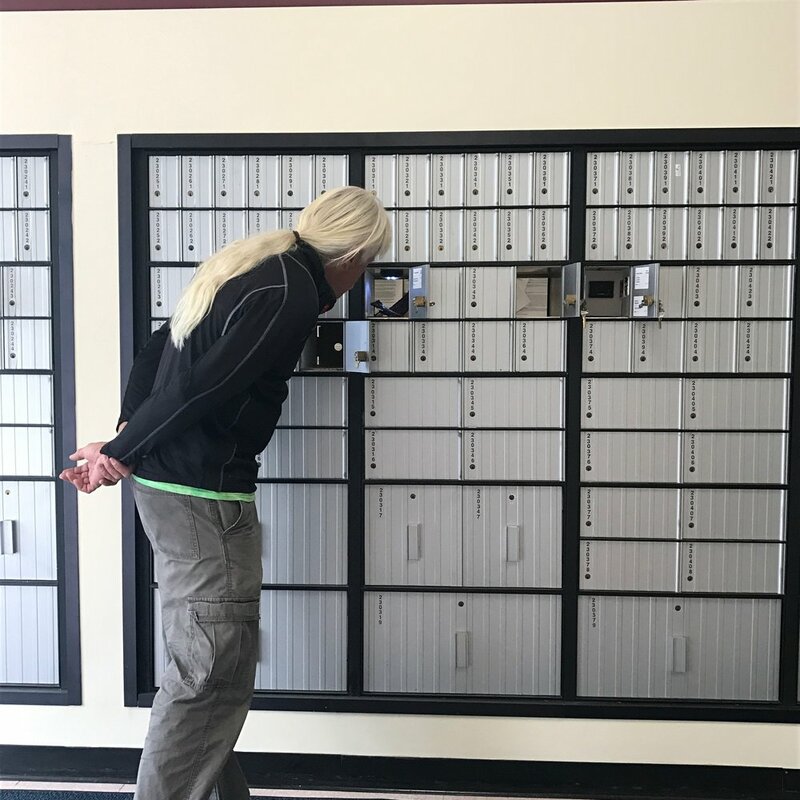 The ten artists showed in small Post Office Boxes that made up this official venue located inside the United States Postal Service - Ledyard Station, 120 Monroe Center NW. Eric is the son of a Michigan autoworker, the grandson of a farmer, and the descendant of one of the women executed during the Salem Witch Trials. He creates activist experimental artwork on economic, environmental and justice themes. He works in printmaking, sculpture, and conceptual art. He has distributed his artwork through mass media and through guerrilla installation and performance. His work is characterized by unusual methods, unusual materials, social activism, and dark humor. Eric attended Michigan State University where he studied fine art and creative writing in their Honors College, paying his way through school by dissecting and embalming cadavers in the MSU human anatomy lab. He received a BFA in Studio Art in 1998. Since then, his artwork has been featured by WIRED, CNN, USA TODAY, Ellen Degeneres, the Chew, and Monday Night Football, and by congressmen on the floor of the U.S. House of Representatives. He works just outside of Detroit in Royal Oak, Michigan. His artwork has been shown in galleries and museums including the University of Illinois’ Krannert Art Museum, San Francisco's Cartoon Art Museum, The Laboratory of Art and Ideas at Belmar, Colorado and the Academy of Fine Arts in Sint- Niklaas, Belgium. 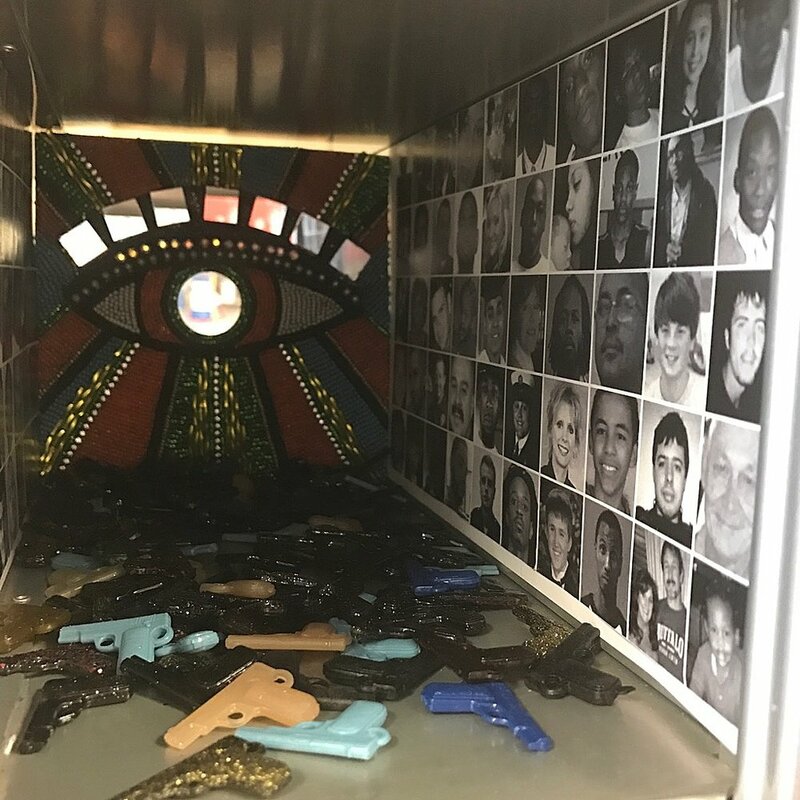 More locally, his work has been exhibited at Michigan State University’s Kresge Art Museum, B414 Gallery in Lansing, Headspace Gallery in Dearborn, Tangent Gallery in Detroit, and Start Gallery in Detroit. His 2017 ArtPrize entry is titled "Made of Money" and is a series of portraits of Nikola Tesla, Vincent Van Gogh, Joe Louis, Edgar Allen Poe, Hedy Lamar based on cut-up strips of paper money woven together. This series to reminds us that our best people aren't always rewarded with wealth, and that our wealthiest people aren't always our best. Firth MacMillan is an artist based in Toronto. She has exhibited at CRG Gallery, Lyons Wier Gallery and Charles Cowles Gallery in New York and at the Art Gallery of Nova Scotia, The Gardiner Museum, and San Bao International in China. A graduate of the University of Nebraska -Lincoln (MFA) and the Nova Scotia College of Art and Design (BFA), Firth is the recipient of numerous awards including an Ontario Arts Council grant, Hixson-Lied fellowships and a Canada Council grant. She is currently teaching ceramics and sculpture at Kalamazoo College in Michigan. Jonathan is a self-taught sculptor and illustrator from Grand Rapids, MI. Initially interested in stop-motion animation, he shifted primarily to still photography in 2009. In the past his sculptures have accompanied him to New York, Washington D.C., Louisiana, and Colorado. Mixing humor with art, Jonathan's main drive for creating is to bring smiles and laughter to viewers. Jonathan is a recipient of a 2017 Frey Foundation Artist Seed Grant. Ed is a ceramic artist living in Kalamazoo, Michigan. He is the best kisser and really good with his hands, but he's all mine. Ed has work all over the world and won a bunch of awards. He earned a MFA from the School of the Art Institute of Chicago way back when. Been throwing his life away ever since (get it) making fun, thoughtful, and functional work. Howard studied graphic art and illustration at Central Michigan University and Kendall College of Art and Design. He is a writer and radio host at Townsquare Media. He resides in the Creston neighborhood of Grand Rapids, Michigan. Official ArtPrize 2017 Entry link.